All five of the Balcombe anti-fracking campaigners on trial at Brighton Magistrates’ Court were today found not guilty of obstructing the public highway and failing to comply with conditions imposed by a senior police officer. The five, Josef Dobraszczyk, Ruth Jarman, Caroline Lucas, Sheila Menon and Ruth Potts, were amongst hundreds of people who were peacefully protesting against Cuadrilla’s plans to start fracking at Balcombe in Sussex last August. All five vowed to continue their campaign against fracking and to stop the exploitation of shale gas and oil. The peaceful protest highlighted widespread opposition to fracking – a controversial process where a mixture of water, sand and chemicals are pumped underground, under high pressure, to force gas and oil from rock layers. Cuadrilla has been carrying on exploratory drilling at Balcombe to see if the area has oil and gas bearing rocks. 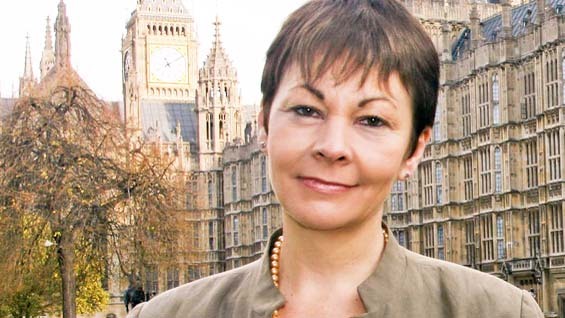 Caroline Lucas, MP for Brighton Pavilion said: “We were peacefully protesting outside Cuadrilla’s site in Balcombe to highlight the environmental impact of fracking, particularly its role in accelerating climate change. “We are pleased that the court upheld our right to peacefully protest against fracking, but this judgement is not a victory or cause for celebration. We will continue to campaign to end fracking and will only celebrate when that has been achieved. “In the light of the UN’s latest report on climate change, it is clearer than ever that exploiting new sources of fossil fuels such as shale gas is fatally undermining the Government’s stated ambition to protect Britain from the worst impacts of climate change. The only safe and responsible thing to do with shale gas is to leave it in the ground. The trial coincided with the release of two major UN studies on climate change. The Intergovernmental Panel on Climate Change’s (IPCC) latest report (1) warned that greenhouse gas emissions from burning fossil fuels were rising faster than ever and highlighted that we can still avoid the worst impacts of climate change but only by urgently switching to renewable energy, reducing energy demand and phasing out our use of fossil fuels. An earlier IPCC report concluded that climate change is already happening and examined the impacts of climate change such as storms, droughts and flooding as well as the risks of inaction on health, food security and water supplies. Climate scientists agree that delaying action to cut carbon emissions is dangerous and will increase the costs of tackling climate change significantly. Experts are clear that around 80 per cent of unexploited fossil fuels will have to remain in the ground to avoid catastrophic climate change (2). Caroline Lucas said that the way forward was being shown by initiatives like REPOWER Balcombe, a new community cooperative set up by local residents with the aim to generate the equivalent of 100% of the village’s electricity usage from clean, renewable energy sources. Caroline concluded: “I know that this is very important to a large number of my constituents, because so many of them have written to me about the environmental risks posed by fracking, and the urgency of tackling climate change. Caroline Lucas did not have any recourse to public funds in order to fight her case.